Guitar players are a fussy bunch. We're after that special something; that combination of playing feel, tone and aesthetics that reaches out and grabs you on a visceral level. That guitar that takes you someplace new. That guitar that calls you to play, and once you do, you don't want to stop. Chances are you've already got a guitar or two that really speak to you. You've got them dialed in and set up just how you like them. Now, what do you do when you need to travel? You've got a couple of choices. You can take your cherished guitar with you and hope that you won't be forced to check it through. You can borrow a guitar when you get where you're going and hope it's something set up tolerably well. 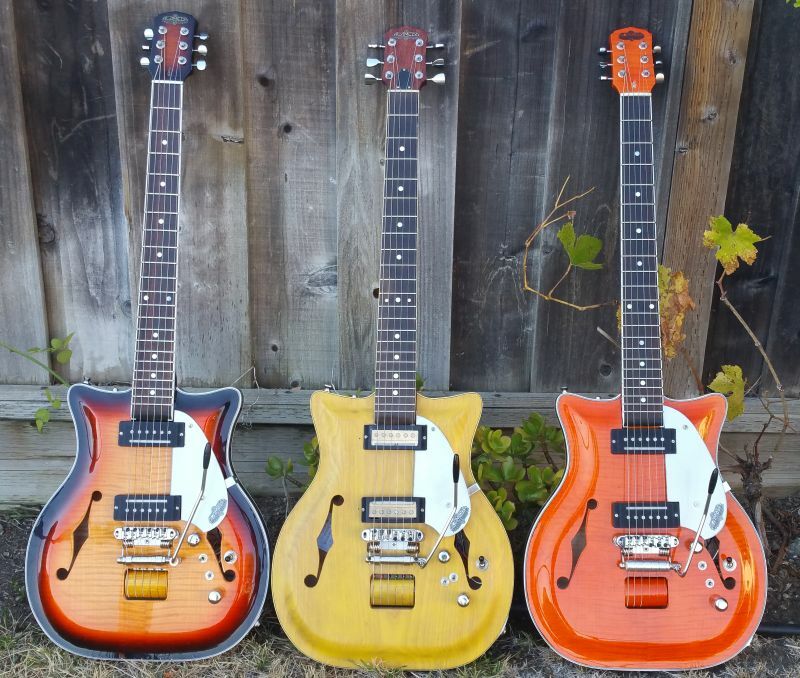 You can get a travel guitar, with a mini-scale or a mini-body or some other odd compromise. Here's where the Alameda FE200 folding electric comes in. This is a no compromises guitar. Full 24.75" scale. 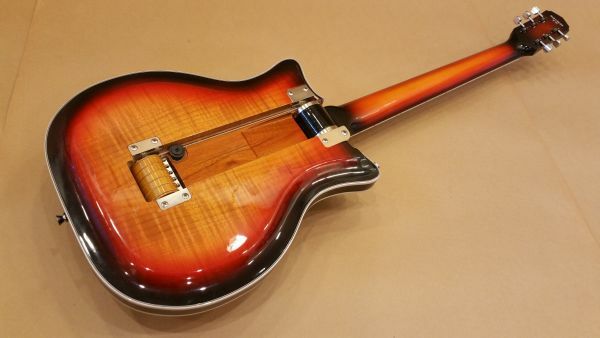 Multi-bound, carved semi-hollow body with a solid core and a single unified acoustic chamber. Flame maple caps, front and back. Custom, hand wound VF3 multi-tone pickups. Unhindered fret access all the way up the neck. 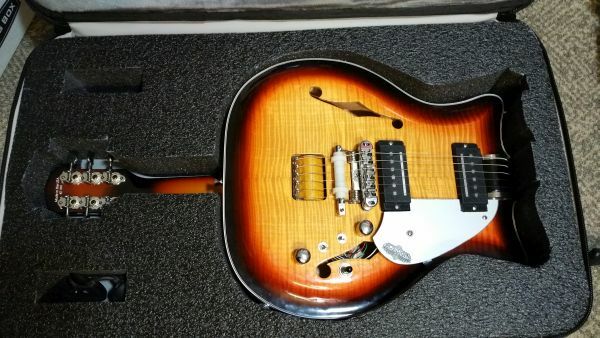 This is an exceptional guitar. That happens to fold down to 24" for travel. This is no ordinary collapsible instrument. Guitars exist with removable or folding necks. What makes the FE200 special? Tension. Folded or unfolded, the patented rotating mechinism of the FE200 keeps tension on the strings. This maintains the balance of truss rod and the neck wood to keep them stable. Strings tuned to pitch exert well over 100 lbs of pressure on a guitar. With Alameda, there's no sudden application or release of this force as there is with other collapsible guitar designs. Want to go places with a guitar you love without worry? The Alameda FE200 is calling you. Surf Guitarists, Reverb afficianados - have we got the pedal for you! There's nothing like the crazy reverb drip of a 6G15 style outboard Reverb; it's the defining tone of surf guitar. That wild reverb comes with a challenge - how much is enough? How to you set the reverb level to have enough drip for palm muting while having the clarity for complex melodies? In the past, this has involved on the fly adjustments to the Reverb mix level as needed. Now, there's a solution. THE DRIP SWITCH. 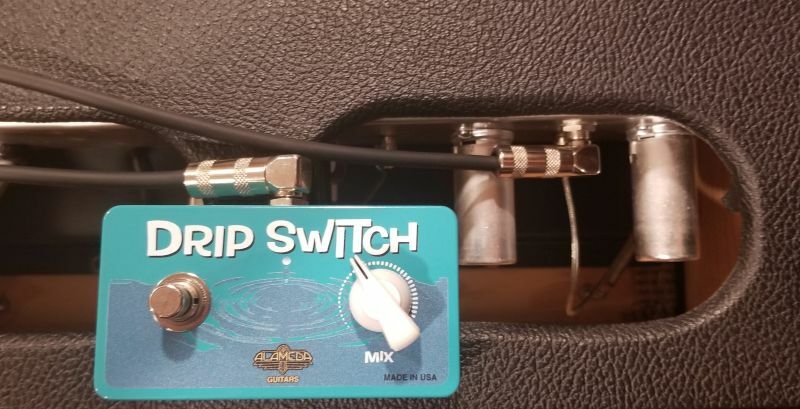 This Drip Switch plugs into the foot switch jack of the Reverb chassis, and gives you the ability to set a secondary mix level which you can select with the pedal. You can also control the Drip Switch mix with your foot as you need - per song or per passage. Using a standard 1/4" instrument cable, connect the Drip Switch to the foot switch jack on the underside of the Reverb chassis (between the two smaller tubes to the right). Set the controls on the Reverb to the your maximum intended reverb level. Use the mix control on the Drip Switch to set lower level. On a Fender style combo amp with vibrato and reverb, you will need our accessory kit to connect the Drip Switch. 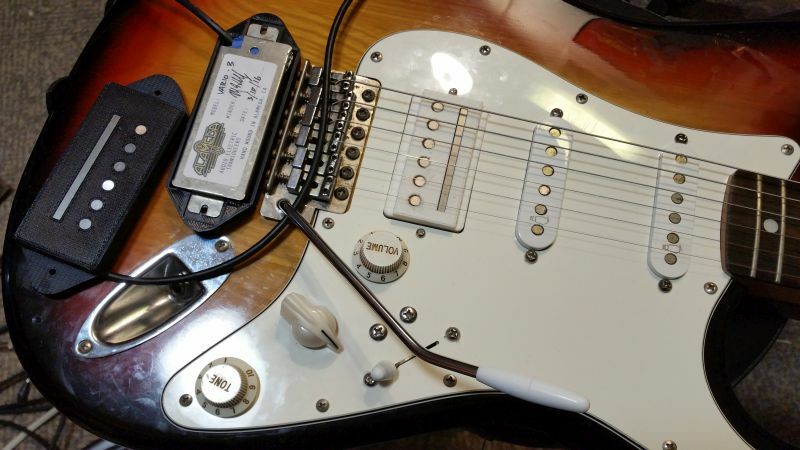 Start by disconnecting the reverb return cable from the Reverb Output jack on the chassis. Plug in the RCA male to dual female splitter to the Reverb Output. Connect the reverb return cable to one side of the splitter, and, connect the RCA to 1/4" adapter to the other side. Plug a standard 1/4" instrument cable into the adapter to connect the Drip Switch. The stock Reverb/Vibrato footswitch is not affected and may be used to turn the Reverb on and off. 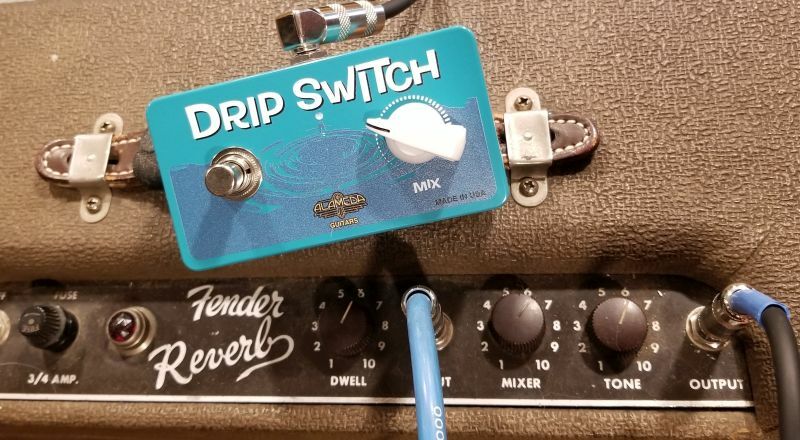 IMPORTANT NOTE: The Drip Switch is designed to be compatible with the Fender 6G15 Reverb tank and Fender combo -Reverb amps both vintage, clone, and reissue. It is also compatible with the SurfyIndustries SurfyBear Reverb. For uses other than the Fender 6G15 Reverb, you may need the additional accessory kit. 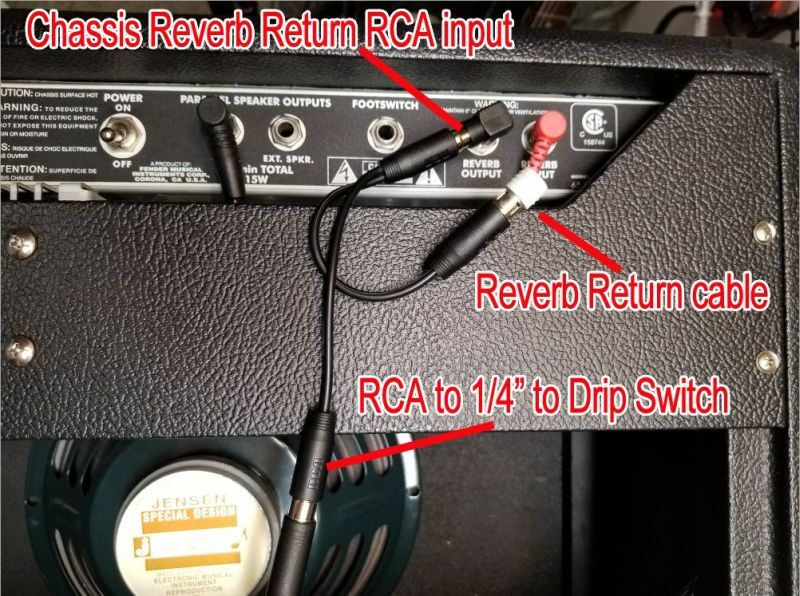 DO NOT USE the Drip Switch with any amps besides the 6G15, Fender combo -Reverb amps, or SurfyBear as reverb circuits vary and the voltages can be dangerous. If you have questions about a particular amp, contact us to review the circuit and discuss. Click the shop now button to visit our shop to buy your Drip Switch today! Looks cool, but wait till you hear how it sounds! Guitar pickups are transducers, turning the energy of the plucked string into an electric signal that can be amplified. 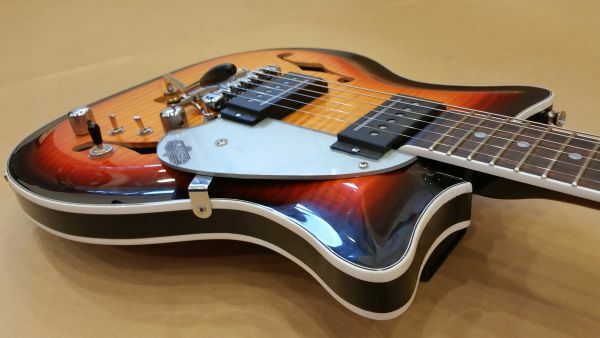 There are a number of classic pickup designs behind the defining tones of electric guitar. This isn't one of them. Rather, ours grew out of our need for a pickup that fit the space requirements of our guitars. Unburdened by the goal of replicating a particular structure, the options opened up. Through several years of experimentation, we created a pickup that is many pickups - the Off Kiltertron. The Off Kiltertron (OKT) pickup is a hybrid asymmetric, dual bobbin, multi-coil design. With a bar magnet bobbin and a rod magnet bobbin, the pickup combines the wider field sensing of a bar magnet with the focused field of rod magnets. However, what really makes the VF3 stand apart from other designs is the selectable coil engagement. Paired with a six way rotary selector, the OKTs give three single coil and three humbucking settings, including single coil and humbucking settings at the same output level. These pickups cover a wide swath of sonic territory. Snappy, twangy, warm, crunchy - you'll find it all here. Used in combination, the neck and bridge together can be sweet, spanky and even quacky. Neck and bridge pickups are reverse wound / reverse polarity so the single coil modes are humbucking when both pickups are used. 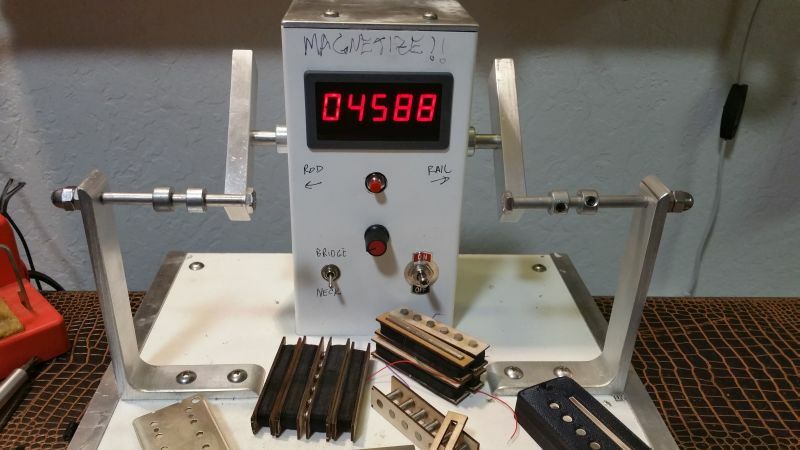 We scatterwind our pickups one coil at a time and assemble them by hand. We build them using AlNiCo magnets, enamel coated magnet wire, shielded backplates, and custom covers - available as a standard sized humbucker, a dogear, a soapbar, Jazzmaster and Filter'tron. The hookup wire is four conductor plus ground. With Off Kiltertrons, you can saddle up, sling your six string and cover the ranch, the range and the whole back 40. 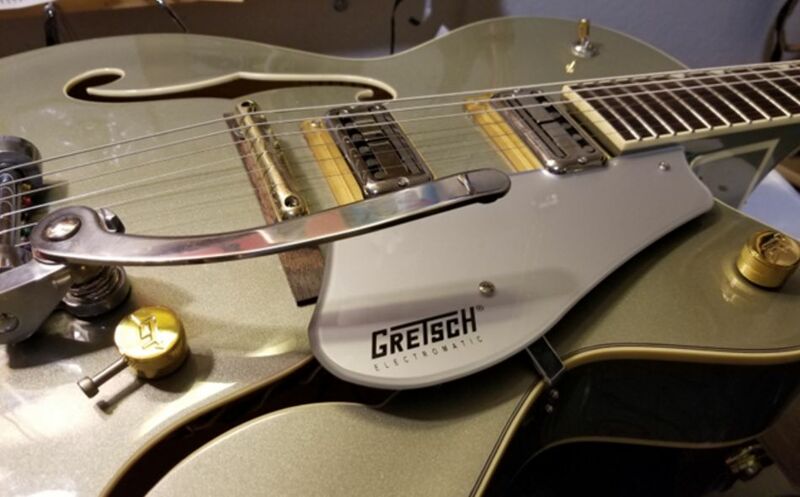 We’ve long been fans of guitars with unique character, and Gretsch guitars have always been a big part of that. Not long after designing the pickups for our own guitars, we started fitting them in Filtertron covers. Our pickups being a bit unusual/peculiar/eccentric, they seemed to be an off kilter variation on the classic ‘Trons, hence Off Kiltertron. Pickups are $180 each. Selector pre-wiring (mini-toggle or rotary) $20 per pickup. Please contact us for more information. Wow, these seem like pretty impressive pickups. How about some sound samples? Can't get enough? How about some videos of our guitars in action? 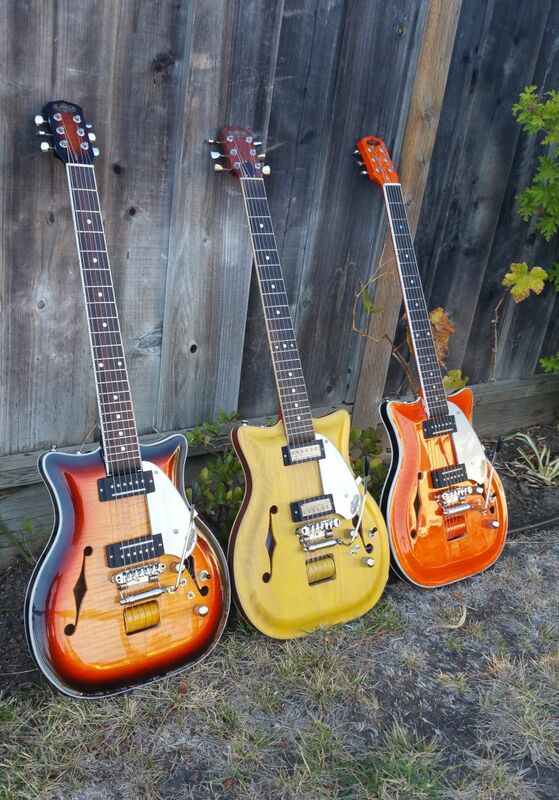 The Mach IV, "Lemon Twist"
In A Jam Band, "Crazy Little Thing Called Love"
The Mach IV, "Beach Bound"
In A Jam Band, "Misirlou"